Please join Studio AND in presenting Urban Meteorites at The Flux Factory SCIENCE FAIR! This event takes place during two weekends only so for all of you future geologists out there, be sure to come visit us. You will be able to pick up a special edition DIY field guide, learn how to identify authentic Urban Meteorite findings, inspect real meteorite slices, books, and more! 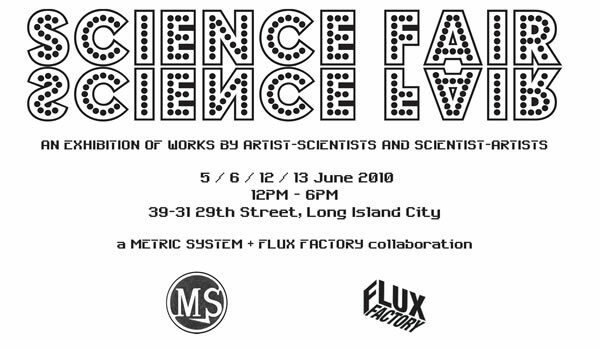 Flux Factory and The Metric System are proud to present Science Fair, an exhibition of works by artist-scientists and scientist-artists! Inspired by grade-school education fairs, Science Fair is a collaborative effort that examines science-based projects and concepts through the lens of art. Artists will create their own presentation booths and interactive experiments to be on display at the Fair. The exhibition explores the potential for science as a breeding ground for art: a way to inform and inspire art as a springboard for creative thought. The Fair will showcase over two dozen projects including an artist-run weather station, robots that draw, urban meteorites, a cabinet of curiosities, and electro-magnetic field mapping. Participating artists: Robin Brehm, Daupo, Lisa Glauer & Kaethe Wenzel, Fred Forest, Samwell Freeman, Hope Ginsburg & Colablablab, Kate Hartman, Jay Henderson, Jaime Iglehart, Scott Kildall, Rafael Hidalgo Múgica, Julia Oldham, James Rouvelle & Lili Maya, Daniel Schludi, SP Weather Station, Chad Stayrook, Studio AND, Flint Weisser, Elizabeth Whalley, Jing YuThe Metric System is a New York-based collective that encourages cross-disciplinary collaborations between artists, thinkers, scientists, and political activists.